We look forward to welcoming visitors to Unity Temple after the restoration is complete. Tours resume July 2017 and public programs early 2018. 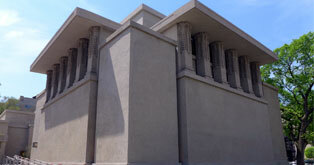 The $25 million restoration of Unity Temple Is now complete and has been called “A Triumph!. Unity Unity Temple is in the news! Local and national publications feature stories about Unity Temples historic restoration. 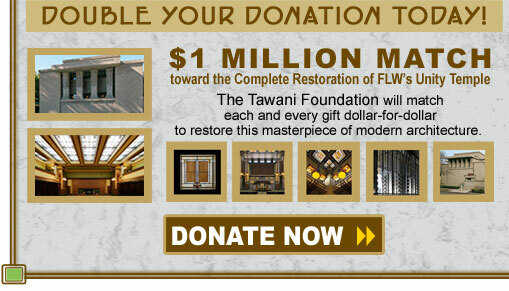 Your gift can support the restoration of Unity Temple, an endowment to maintain this historic landmark and future programming at this incredible venue. All Tours Managed By The Frank Lloyd Wright Trust. Unity Temple Restoration Foundation restores and preserves Frank Lloyd Wright's 1909 masterpiece of modern architecture, Unity Temple. UTRF also advances Unity Temple's global contemporary significance with programming that embodies Wright's spirit of innovation and enriches the lives of those it serves. A selection from his last television interview from October, 1958. Wright discusses the significance of the design of Unity Temple and how it relates to his vision on modern architecture.